In the Catholic tradition, to be confirmed is to be chosen — chosen by God to be a sign of God’s presence in the world. 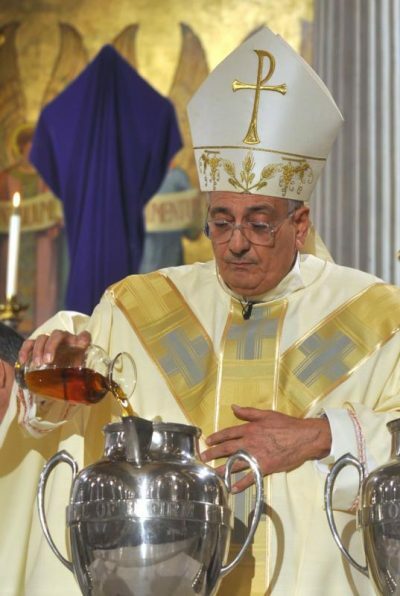 “Be sealed with the gift of the Holy Spirit,” declares the bishop (or, sometimes, a priest) who ministers the sacrament, as he traces the sign of the cross — a sign of consecration — with the sacred chrism oil — representing health and strength — on the recipient’s forehead. With this action, the newly confirmed “shares more completely in the mission of Jesus Christ and the fullness of the Holy Spirit with which he is filled,” so that his life may emanate “the aroma of Christ,” reads the Catechism of the Catholic Church (No. 1294). “The Lord said: ‘There — anoint him, for this is the one!’ Then Samuel, with the horn of oil in hand, anointed him in the midst of his brothers, and from that day on, the spirit of the Lord rushed upon David” (1 Sm 16:12-13). Jesus himself makes known the power and purpose of anointing in one of his first public actions, the teaching and proclamation of Scripture in the synagogues, for which he was well-received — at least, initially. Then, in his hometown of Nazareth, he quotes Isaiah — “The Spirit of the Lord is upon me,because he has anointed me to bring glad tidings to the poor” — and adds, “Today this Scripture passage is fulfilled in your hearing” (Lk 4:18, 21). The ensuing uproar causes those assembled to drive him out of the town — a lesson to Jesus’ followers of the risks awaiting the anointed ones who seek to do God’s will. St. Paul, for one, took that lesson to heart, fearlessly proclaiming the good news despite enduring persecution and punishment throughout his ministry. “The one who gives us security with you in Christ and who anointed us is God,” Paul tells the people of Corinth. “He has also put his seal upon us and given the Spirit in our hearts as a first installment” (2 Cor 1:21-22). And the catechism echoes that promise: “This seal of the Holy Spirit marks our total belonging to Christ, our enrollment in his service forever, as well as the promise of divine protection in the great eschatological trial” (No. 1296). Catholic journalist Mike Nelson writes from Southern California.